The Adrenalin Rehab team is made up of 60% girls, so its really important to us to encourage women into cycling & mountain biking and to celebrate the women whose adventures and achievements inspire us to get out there and ride! Understandably, when we discovered the superwoman known as Emma Timmis we were obsessed! 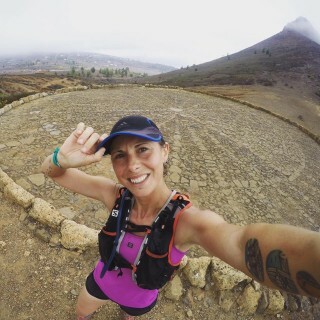 Emma has cycled from Manchster to the Italian Dolomites and she even ran across Africa! 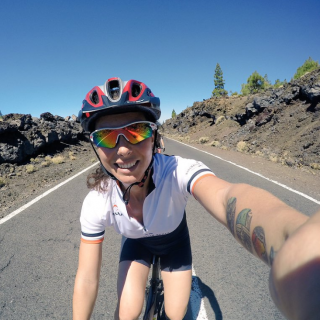 We invited her out to Tenerife for a week in the saddle to get a taste of what Adrenalin Rehab has to offer. Now onto her next adventure, we managed to catch her for a chat to discuss her Adrenalin Rehab experience, encouraging women into sport and what adventures she has planned next! I'm currently 32 years old. I'm from Derby in the Midlands and I have spent the last two years travelling around the world trying to live as adventurously as I can. My love for travel started when I turned 18 and decided to go travelling for a year rather than follow my friends who were going to University. I have always been a very active person and now I like to combine travelling with the sports I love! What is the biggest challenge you have faced as an adventurer? The greatest challenge I face on every adventure actually happens before you leave your home. Overcoming the affect of negative people that try to squash your dreams, actually daring to take the risk and do it, and all the planning and preparation involved. Once your adventure has begun everything actually gets much easier! You joined us in Tenerife on one of our bike holidays - how did you find that experience? The trip to Tenerife was fantastic. I joined a group of people who shared the same passions and the same attitude as myself. We laughed so much throughout the week and got to explore a beautiful island. There were a lot of hills! I personally loved this, pushing myself to cycle up a 29km long uphill on day one will be something that sticks in my mind forever. The island is so incredibly beautiful and the weather was perfectly warm. I spent half my week road-cycling with the group and the rest of the time alone running and exploring the island's amazing trails. I found winding, technical trails running up and around the mountains, and also flatter, easier trails that hugged the beautiful coastline. This was a perfect holiday to get some sun on my skin and escape the British winter! Do you find it important to encourage other women to get involved in sport and get out of their comfort zone? How can beginners take that first step? I 100% encourage women to get out and get active. Taking part in various sports over the years has taught me so much about my abilities and my strengths, as well as how to push myself and learn new skills. I would advise people to find a local group or club if they are not completely confident in getting out there by themselves! 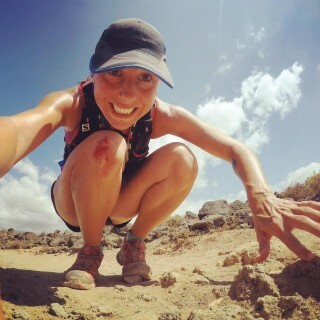 Also, I follow lots of female cyclists, runners, climbers etc on Instagram and when I see their photos it definitely encourages me to get my trainers on and get outside. Where will your next adventure take you and how can we follow your journey?! At the moment I am based in Queenstown, New Zealand which is all about adventure and being outdoors. Over the next half a year I am focussing my energy into running again. It has been quite a long time since I described myself as a runner but now I want to get back into competing at distances longer than a marathon. Later next year I will be taking on a very long distance adventure on wheels so watch this space! You can follow my adventures on Facebook, Instagram, Twitter, and through my website www.emmatimmis.com! Thank you for your time Emma. Anything to add before we say goodbye? If you are looking to have a fun packed, high energy adventure in a beautiful tropical location then I would recommend going to Tenerife with Adrenalin Rehab. They have the guides and bikes already sorted for you which takes the stress out of organising your own routes and researching the island. The hotel was brilliant with lots of food available at the breakfast buffet. There are many different routes that the friendly guides can take you around so you will be spoilt for choice! Inspired by Emma's stories? We can tailor our bike holidays to your abilities and goals to ensure you get the most out of your riding and have the best adventure possible! Check out Our Tenerife cycling holidays for winter 2016 and our Lake Garda cycling/MTB holidays for 2017!